Zack MacEwen will make his much anticipated NHL debut with the Vancouver Canucks tonight. The 22-year-old will suit up against the San Jose Sharks at Rogers Arena, head coach Travis Green confirmed after an optional morning skate. He’ll start on a line with Bo Horvat, as Brandon Sutter is expected to sit out with a minor injury. MacEwen will make his @NHL debut tonight, confirms Coach Green. 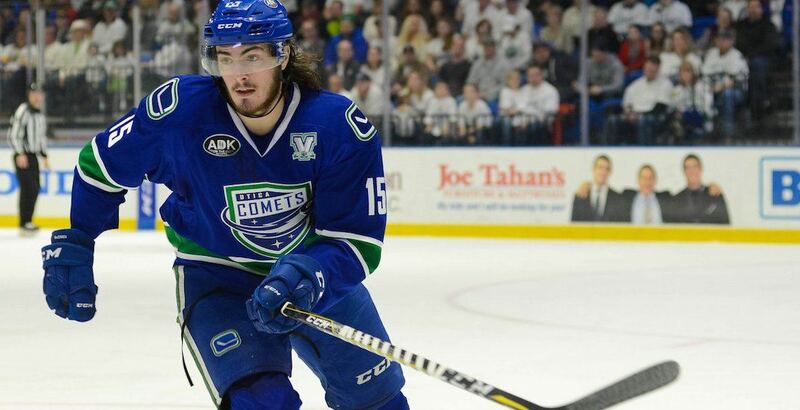 MacEwen, who got a 2 am phone call with the news of his promotion while travelling on a bus from Utica to Bridgeport on Sunday morning, is having an outstanding season with the Comets, scoring 42 points (17-25-42) in 49 games. The 6-foot-4, 212-pound right winger has exceptional size, but it is the quick development of his skill that earned him a chance with the Canucks. MacEwen was signed as an undrafted free agent while playing in the QMJHL as an over-age player in 2017. Fans, and presumably the organization, are hopeful that the Charlottetown, PEI native will be able to carve out an NHL career, perhaps as a bottom-six winger. MacEwen had to improve his skating, and says that his poise and confidence with the puck has taken an extra step this season. “The ultimate goal was to get to the NHL, and here I am,” MacEwen told reporters after the morning skate. “I’m not just happy being here though, I want to stay. He’ll get his first chance tonight.